This is a tried and tested method that scores well in the Hattie effect-size rankings. It’s a process with a great deal of potential. From my experience, it works best when students are asked to go beyond explaining something they’ve understood themselves; they are actually asked to teach it so that other students also understand. As we all know, when preparing to teach a set of concepts, it requires deeper understanding than a straight-forward explanation might; at the very least it demands a greater level of clarity in the way the explanation is communicated. For example, my son’s class in Year 4 had a lovely exercise to help them learn the language of giving instructions. They each had to teach their classmates a skill and write out a full script of everything they needed to say. My son taught them all how to play the ‘Smoke on the water’ guitar riff during the class group-guitar lesson. In working out the sequence of notes and how to explain each chord, he reinforced his own knowledge. The class enjoyed several weeks where they were taught some interesting things by their peers. Kinetic theory linked to idea gas laws. 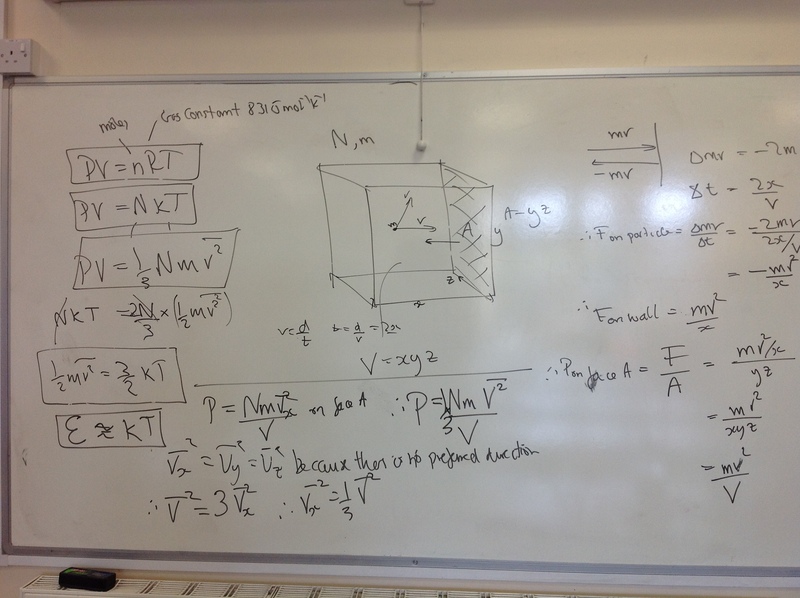 One of my favourite bits of physics. It requires quite a lot of conceptual thought with lots of steps in the right order to lead to the final solution. By getting ready to explain this in depth to the whole class, the students will need to make sure they understand it in significant detail; it won’t be enough just to learn it by heart without understanding it. ‘Teaching it back’ is a cornerstone of the co-construction process I use with my Year 9s. I spend a bit of time with the leading team making sure they understand the concepts before they teach the class. Here Asad is explaining how a lux meter works and how students can use it to explore the phenomena of absorption and transmission. 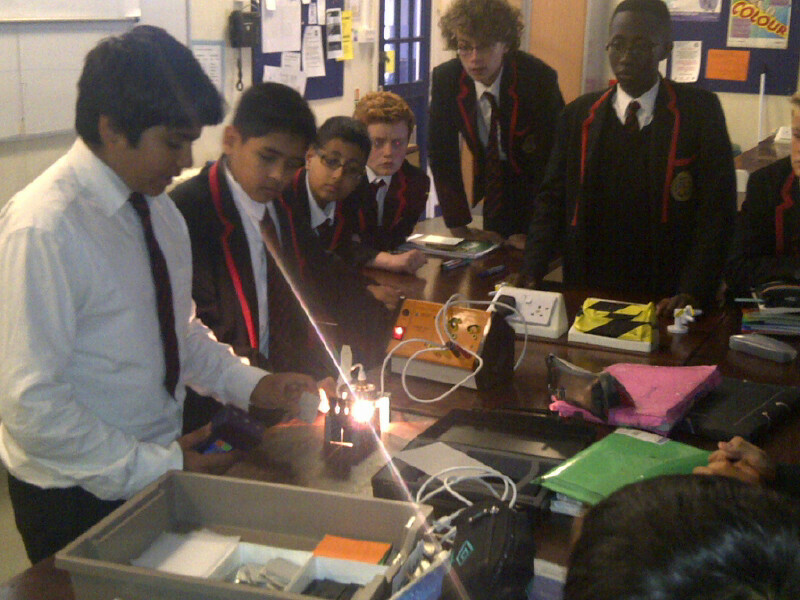 Asad teaching how to use a lux meter. The pressure can in full flow, as was Trevor! 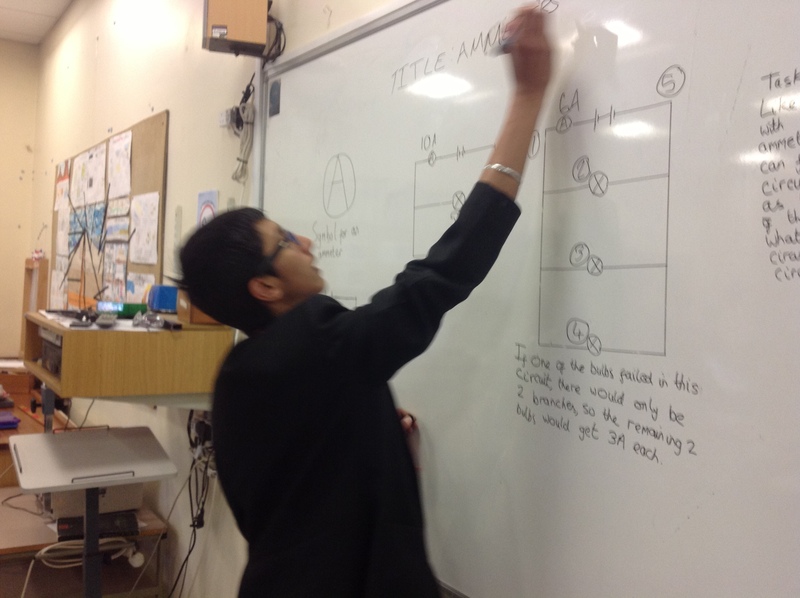 In this example, Kieret is setting out some questions relating to basic circuit theory leading on to a practical where students tested their own circuits, measuring currents at various positions. One of the most important aspects of this process is that students make mistakes; each mistake highlights an area where their conceptual understanding isn’t as deep as you might have imagined from some more routine classwork. In giving their explanation in teacher-mode, they reveal more about what they do and do not understand. This is your cue to intervene to clarify or challenge as necessary. Teaching it back, is one of the best ways to flush out misconceptions – in my experience. 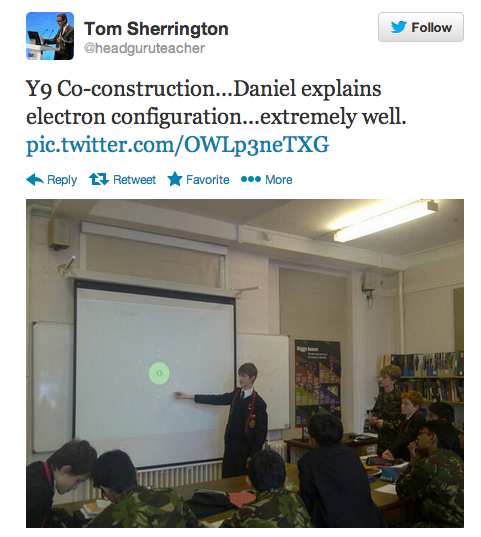 The electron configuration lesson as reported on twitter. 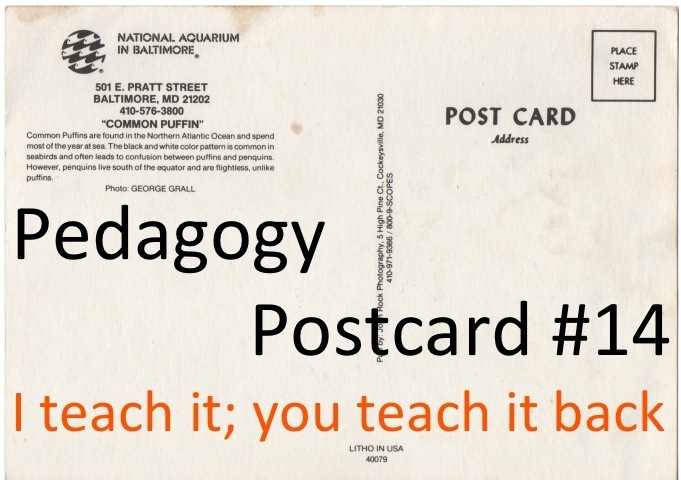 « Pedagogy Postcard #13: Open-Ended Tasks. Sorry, still not convinced….. Opportunity cost. Also, why can’t the same thing be achieved through a carefully designed written test? (In the approach above, you can only assess the understanding/misunderstanding of one presenter). It’s actually not an opportunity cost. I find it very efficient; believe me, we haven’t got time to muck about. This process is a useful precursor to the testing. If one student gives an extended teach-back exposition it often shows up several key things to emphasise for everyone as part of the learning process prior to formal assessment. It’s more interactive and organic at this point. Of course they all need to be tested on it – but it’s a good way to check whether the ideas are getting across as part of an overall strategy. I could do it all myself but that wouldn’t be as good – in my view. Actually I think there is good research evidence on this.. I’ll need to find it and cite it. Not that I’m too worried about that in this instance. Thank you for your reply (I know this isn’t the first time I’ve raised this). One of the problems in communicating this is that the detail is important in understanding what actually happens and what the pros and cons are. If this ‘talk back’ process is part of a revision/rehearsal package, then I can see how it fits in…..and your comment above clarifies that point. I think that the size effects are a red herring in this case, as the approach is part of a larger strategy. I agree; the details matter. In particular I find that describing any strategy that one might use from time to time risks sounding as though this is what happens all the time; I don’t want to overplay the significance of any of these ideas. The effect sizes only hint at possible supporting evidence but there needs to be strong like-for-like alignment to put any weight on it.